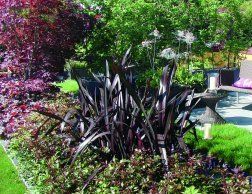 Plant Phormium 'Black Adder' in full sun or half a day of sun. It's tolerant of both dry and moist soils, but doesn't like being in waterlogged soils for extended period of time. Keep the soil fairly moist until the plant's established. Black Adder makes a stunning focal point both in the ground or in a container. It combines well with many plants and looks particularly striking when combined with silver or gray-leaved plants, pinks and yellows. 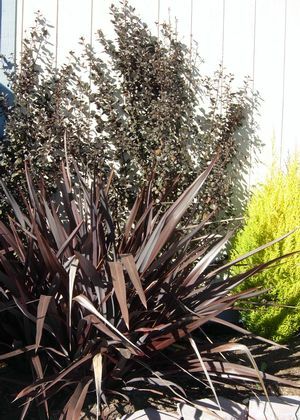 Black Adder is bred from Phormium cookianum ‘Platt’s Black’, a particularly attractive dark phormium from New Zealand that is known for being one of the darkest ever. Science combined with chaos theory to create this new, super dark hybrid. A sport’s sport, Black Adder’s provenance can be traced to a tissue culture mutation of Platt’s Black. The results are stunning. Where Platt’s Black's long slender sword-like leaves are deep, deep brown, Black Adder’s are a deep burgundy black with a high gloss overlay. This glossiness accentuates its deep color and nearly eliminates sun fading. Unlike its parent, Black Adder is a strong and healthy grower, perfect for time-pressed gardeners who want performance without all the fuss. Its potential uses in the garden are varied and appetizing. As an accent plant, Black Adder is hard to beat. 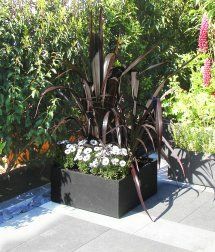 Its dark coloration and elegant architectural form are dramatic in garden beds, massed plantings and containers. As a cookianum type phormium, its leaves are upright but not stiff and spiky like the tenax types. Black Adder’s narrow leaves stand tall, with a charming drape at the tips. When mature, it grows up to three foot tall by three foot wide, medium-sized in the world of phormiums that can reach ungainly heights of 10 feet, or more. Black Adder is a no-fuss herbaceous perennial that remains evergreen year-round, where hardy. Rugged and easy-to-grow, Black Adder is suited to exposed conditions and coastal planting. Once established, it is drought and wind-tolerant. 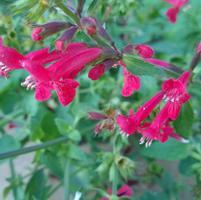 It is less tolerant of high humidity and over-watering. Like all phormiums, it performs best in rich, well-drained soils; though will readily take tougher conditions in stride. Phormiums are hardy in USDA zones 8b-11. 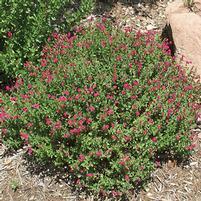 They are hardy only where temperatures do not dip below 20º F. In colder areas, gardeners will still appreciate Black Adder for border, container and accent plantings. Over-wintering the plants indoors in a cool sunny location is an option in many marginal areas.